For a few weeks back in July/August (?) on Friday nights, before Great British Bake Off Extra Slice, there was a show on BBC2 brought to you by those sugar superfans Miss Hope and Mr Greenwood called Sweets Made Simple. One of those show that makes you drool and want to make everything. So while we were in the UK I picked up the book (obviously), and was eagerly awaiting the opportunity to try out some toffee making! I even bought a new pan. Oh yeah. This was serious business. That, and I had always found previously that it was kind of difficult to see the changes in the colour of the sugar in my non-stick pans against the dark background. Anyhow, Mr M and I had our first, second, and third attempt last weekend…. Number 1, too pale, wrong consistency. Number 3…… too pale, wrong consistency, we had a big row over it, didn’t speak for a few hours…… so we thought we would leave another attempt for another time! This weekend I thought I would risk another attempt – batch number 4? Nailed it. You can find the original recipe on the BBC website here, but I have copied it right here below, along with some tips that we found helpful through trial and lots of error! Pulled Butter Toffee Recipe – taken from the BBC series Sweets Made Simple and accompanying book. groundnut oil, for greasing – aka Peanut oil, it doesn’t taste like peanuts though, thankfully. But if you like, you can substitute any flavourless oil, it is just to stop it sticking. You will also need a pair of rubber gloves (or two, if you have a glamorous assistant like I did! ), and a baking tray. Lightly oil a baking tray with groundnut oil. Quickly pour the mixture onto the prepared baking tray, taking care as the mixture is very hot. Leave for about 20 minutes until cool enough to handle. – LIES! Keep an eye on it! Especially if you are lucky enough to have marble/granite counters in your kitchen as it will cool much faster than this and will be solid and you will be sad. You can test by tilting the tray and checking to see how liquid it is in the centre. Because you shall be manipulating the toffee with gloves, it doesn’t need to be that cool. I also poked it a little at the edges – but CAREFULLY! Remember it will be super HOT (to begin with at least). I started to fold the edges into the centre towards the end of the cooling time, as they were starting to harden, and the middle wasn’t quite cool enough to handle yet. Put on rubber gloves and oil them with groundnut oil. Take two diagonally opposite corners of the toffee and pull them over into the middle of the toffee. Then take the other two opposite corners and pull them into the middle to almost meet the others. 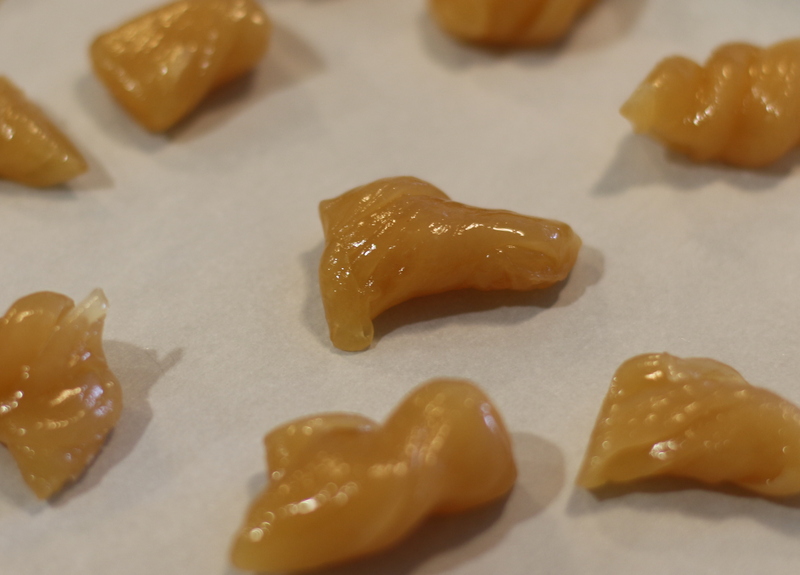 Take two corners and stretch the toffee out like a long sausage, then take the ends and fold them into the middle. Take hold of the two ‘new’ ends and pull them out like a sausage again, fold them into the centre and keep repeating. Keep doing this about 10 or 15 times. The toffee will turn into spaghetti-type strands. Now twist the strands together like a corkscrew to form tight barley twist ringlets. Chop into 2.5cm/1in long sticks using some sturdy scissors. Wrap in individual parchment twist wraps or pretty cellophane. The toffee will keep for a long time so long as it is wrapped and kept dry. Hurrah! We had success! Now I am feeling like I want to try it maybe with a little bit of ground ginger in the mix? 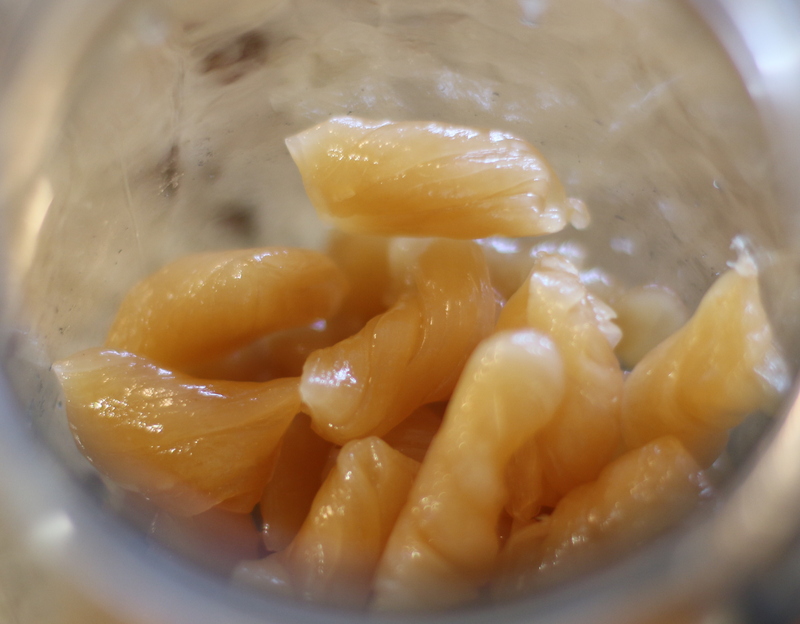 Or maybe fold in some crystallized ginger chopped up real tiny!